This is too good. Denise Dumoulin, a PT from Bloomfield, MI sent me this picture. 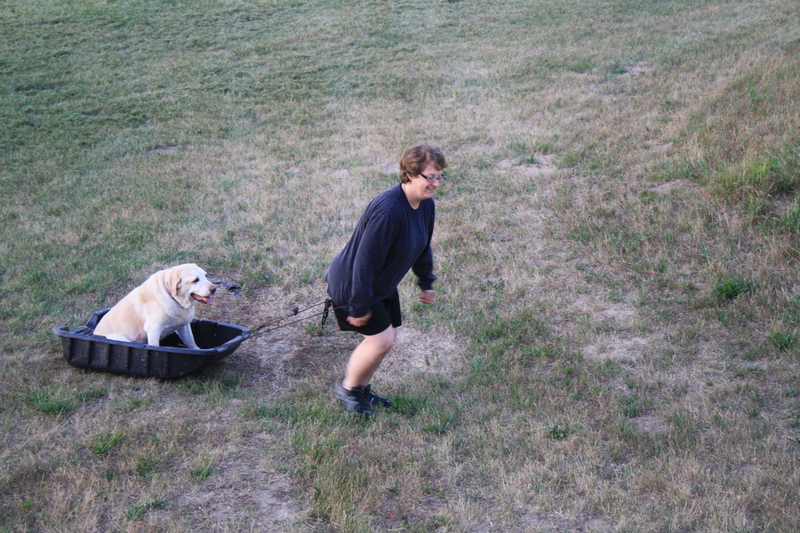 It brings new meaning to the term dog sled. Your boss isn’t going to buy you an X-Box if the reports you were supposed to file are two days late, if you can’t play college hockey no one is going to buy you a team, if you don’t win a championship, no one is going to give you a trophy! If you want something bad enough, you have to work, fail, succeed, fall, get back up, endure, overcome and believe! None of those intangibles can be bought. There are no price tags on work ethic. It can’t be found in aisle three. Too many times in life it’s not what happens but how you react that truly builds success. As Coach John Wooden once said “Things turn out best for those that make the best out of the way things turn out.” The true measure of success is in the effort, not the destination. Anthony Donskov, MS, CSCS, PES, is a former collegiate and professional hockey player, founder of Donskov Strength and Conditioning Inc., (www.donskovsc.com) and Head Instructor/Director of Off-Ice Strength and Conditioning for Donskov Hockey Development (www.donskovhockey.com). He can be reached at info@donskovsc.com. How many times have you met someone from high school and thought “wow, they haven’t changed a bit”? Sometimes that thought is a compliment, sometimes not. One thing I have concluded is that most people who were jerks in high school, are still jerks. Aging is a process of chronology not necessarily of growth. We will always age but we may never grow. Do yourself a favor. Read the great self help books. Start with Dale Carnagie’s How to Win Friends and Influence People . Maybe move on to some Steven Covey or John Maxwell. It is important that we work on growing up as we grow old. I finished Mindset a while ago. I have to admit, it was tough read/ listen. I did a bit of both but, ended up listening to more than I read. I kind of forced my way through it because my friend Mark Verstegen recommended it so highly. I’d call it a tough but worthwhile read. I wanted to share a few things that stood out over the next few weeks. The author, Carol Dweck, makes some great points during the book but you have to stick with it to get to them. One of the best to me was a two page section on Albert Einstein ( p 55-56). The line that grabbed me was “what set him apart was mindset and drive”. In the previous page Dweck describes Einstein as not a loner in a lab but, a highly successful entrepreneur with a well funded lab and thirty assistants. However what stood out was Einstein never ending search for improvement, another example of what Dweck calls the growth mindset. If maybe you did what I did, which was start Mindset and put it down, finish it. It will be worth it. If you haven’t done at least five of these I’ll eat my hat. My daughter told one of her friends at a U-12 game a few years ago that she has to play harder if the games are far away because she doesn’t want to listen to me on long rides home. I know people will see me as just another Crossfit hater but this was too funny to pass up. A lot of you will laugh. A few of you will write nasty comments. Please note that there is bad language in the post. If the f word offends you, skip this. Thanks Jon Messner from StrengthCoach.com. Here’s another book that I bought for our whole staff. What does a book like The One Minute Manager have to do with strength and conditioning or personal training? Simple. When you are on the floor, there is no time for lectures. You need to make points clearly and positively. The The One Minute Manager teaches you how to do that simply. The book will make you the master of the one minute praising and the one minute reprimand. Think of yourself as the “manager” of your group, team or clients.